My daughter is in her 3rd year of horseback riding. She is only 9 now, so she started when she was pretty little. 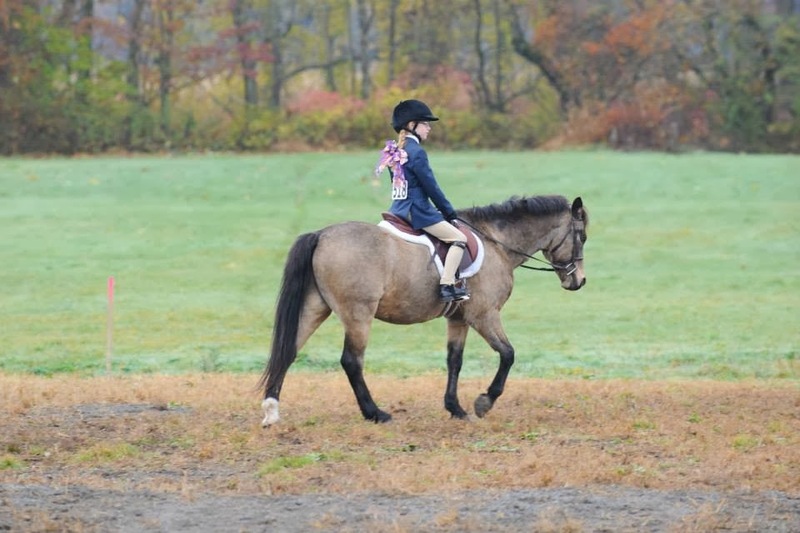 She only started showing last winter, and last year, she only did two schooling shows. But this summer, and fall, she started doing formal shows, and ribbons started to pile up. Some of the other parents said to me "oh, I just took fishing line and hung it corner to corner in my daughter's room, it works fine". Fishing line? Not in my house where there's all this fabric laying around. So I measured the width of the wall I wanted to hang them ribbons on. It would have been about four WOF cuts, so I cut five 2" strips so that it could swag a bit. The fabric is from Fleurish by Valori Wells (for Free Spirit). I did the mitred corners, just as if I was making binding so I could get one long strip. Then I folded the fabric in half the long way to make a seam, opened the fabric back up, and then folded each side in towards the middle (see the picture below). Then I folded the fabric together again, so no cut edges were showing, and had about 1/2" wide of a 200" or so long strip. I sewed a straight line, right up the entire length, right in the middle. Then I folded the ends back onto the strip and sewed a box to hold them closed. Here is my sweetie, with her best friend and pony love, Shady. She has two lessons on him a week and he just loves her to pieces. This photo was taken at the next to last show for the season, it was a gorgeous fall day and the show was outside. There was enough to have three sections, but I couldn't take it all in one photo, so this is the right hand side. You notice the pink on one wall and blue on the opposite walls? She wanted her room to look like cotton candy. This fabric strip is so much prettier and festive looking to me than fishing line. Besides, I have to find some use for all of this fabric don't I?